Today was a really special day – it was our annual end-of-summer Banquet! This year’s theme was Bringe Loving Hertes. This is the phrase written in Old English above the windows on Woodsheart, camp’s first cabin. 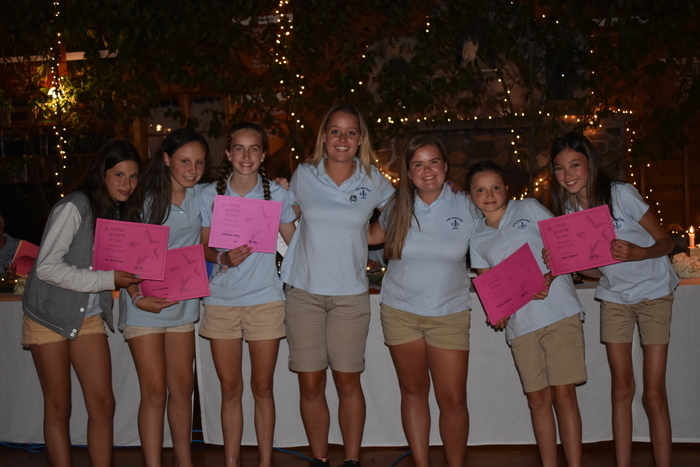 Our amazing counselors wanted to highlight camp’s mission as well as the caring nature and outstanding campspirit that all of the girls have exhibited this summer. Before the fun could start, the girls spent the morning cleaning cabins for White Glove cabin inspections. Sandy and Randy went around to every cabin to check every nook and cranny for dust, to make sure trunks were packed neatly, and to check for overall organization/neatness. It was a tough competition because every cabin cleaned really well! But at the end of the day, the Bluebirds won for cleanest cabin! After cleaning the cabins, it was time to get ourselves cleaned up and into uniforms for Banquet. The counselors spent all day decorating the Hearth and making sure that all of the awards the girls have earned this summer were in order for the night. Watching the girls walk into the Hearth to see the decorations for the first time and discover this year’s theme was awesome. It is worth all of the hard work of putting Banquet together just to see their faces. As the night went on, it was clear just how hard these girls have worked all summer. Name after name was called in recognition of a wide variety of accomplishments. So many girls reached their goals this summer, learning new skills along the way. We’re so proud of each and every one. It’s been a pleasure to be part of their journeys this summer. We finished the night with the big announcements letting all of camp know which teams had won the two team trophies. All of camp got to cheer – the Les won the Leahy Cup and the Jolis won the Crown Trop! Tonight’s Banquet was a great way to celebrate a great summer. It’s hard to believe we’re almost done, but cannot wait to see all of our parent visitors tomorrow! Jeanne d’Arcers: Where Are They Now?